Today we have learned even more about John Streets. We found out that he used to get inspiration for his poems when in the trenches. We also found out that he was very kind and generous. We think these are good values for an English Hero. This is our writing bunker. We pretended to be soldiers and wrote letters home to our families. We used really good sounding out as this is what we have been learning in literacy. 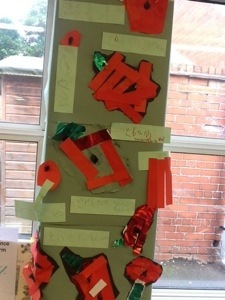 We are each making our own poppy this week. Here are green group’s. They all wrote ‘thank you’ with their poppy using the ‘th’ sound learned today. 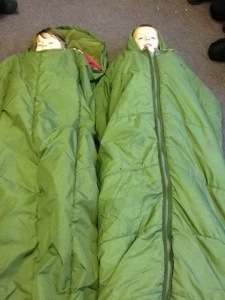 We are very lucky to have two real army sleeping bags and a real army net. 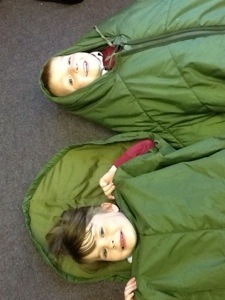 These have been used by real soldiers to help keep them warm and safe. 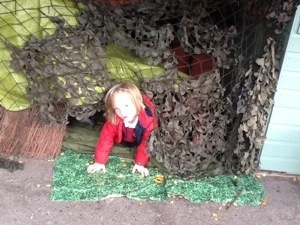 We talked about what it might be like inside a bunker and how the soldiers might be feeling. Look back at the blog tomorrow to see our writing bunker.